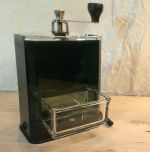 Hario "Skerton" Coffee grinder with ceramic burrs. This was our very first grinder and it still gets used daily! The Hario Skerton Grinder has a glass collection pot with hopper cover to help keep freshly ground coffee fresher! Lovely to look at and easy to use. The Hario Skerton Coffee Grinder has an adjustable grind and silicone lid to hold the beans in the upper chamber while grinding. Also comes with anti slip base. The approx capacity of the Hario Skerton is 100g.